Sticky, light, comfort. I’d been searching for a long time for an approach shoe that was light, nimble, had a very sticky sole, was comfortable and breathed well for long days on the trail, and didn’t have a stiff rand designed to help it actually climb vertical rock. I wanted the ideal Canyonlands or Toulomne shoe, one that could cruise with the comfort of a running shoe, had enough support for a decent backpack, yet keep things solid when the rock got slick. My ideal shoe had been Five Ten’s Five Tennie, the company’s first approach-type shoe, created in the late 1980s, which has been long gone. I’ve been testing out Five Ten’s new Freerunner V2 for a month or so now, and while this shoe is specifically designed for Parkour, the gymnastic aerial assault that lends itself to flips and jumps and tumbles that defy reason, it actual meets my needs for the ideal approach shoe. The V2 is now my go-to shoe of choice for anything approach related. You cannot miss with this shoe. While it’s easy to find numerous light-hikers that have decent grip, it’s not so easy to find shoes with superior grip, the kind Parkour-crazies need, and the kind of grip I like to have when backpacking long distances on slickrock in places like the Needles District of Canyonlands National Park, or scrambling up to the local crag at Donner Summit. The Freerunner V2 delivers, and then some. This shoe is excellent, comfortable and durable. These shoes boast 5.10’s Stealth mystique rubber, the stickiest in the game, ideal for walking up brick walls, cliffs, or even moderate slickrock dunes. The V2 sports a retro day-glo green accents as well, harkening back to the old Five Tennie days, which I like. As with the old shoes, the Stealth rubber will wear down – this is normal, but all told, the sole is fairly durable. Built on a great sole with a moderate arch, excellent heel stability and support, and extremely nice tri-density EVA cushioning, I’ve put in a lot of miles hiking and scrambling with these shoes and the feet really like them. The toe-box runs a touch large for my foot, which is generally a straight medium width. So if you have a narrow foot, make sure to try a pair on to make sure you get a good fit. The lacing system is nice and smooth, easy to use, and stays put. The synthetic leather upper does have some perforation, but overall, these shoes run pretty warm as there really isn’t any venting or mesh – good for keeping sand and dirt out, but your feet will probably sweat a bit. 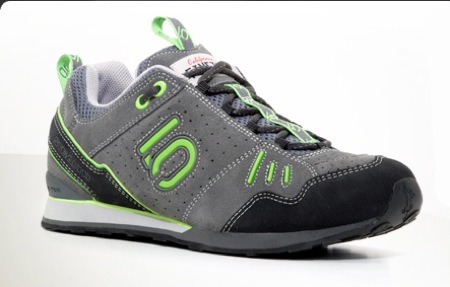 Word has it that Five Ten will be reviving the long-dead, original Five Tennie next season, so stay tuned for a look at that shoe as well. Are the soles on these resole-able at places such as “The Rubber Room”, “Yosemite Bum”, “Fly’n Brian’s Climbing Shoe Resoles”, etc.?? Rubber Room in Bishop does resoles on approach shoes for $48.